Most people know that the Brothers Grimm, who we owe so much to for the modern fairy tale, offered anything but the Disney magic. As dark deconstructions that centred around themes such as innocence lost, greed, lust and pride, they were much more interested in being stories of punitive morality then they were fun adventures filled with romance, princesses, and knights. Related reading: Matt's review of the original PlayStation 3 release of the game. The Witch and the Hundred Knight is very much inspired by the original work of the Grimm duo. Within a narrative that twists and turns with scattershot speed by the standards of any JRPG, what we have here at core is the story of one very screwed up witch and the incredibly unpleasant things that she gets up to. And just to ram that fact home – in the opening chapters of the game the witch (Metallia) has her servant, the Hundred Knight (that being you) defeat the forest witch in combat – who turns out to be her mother. Metallia then turns the forest witch into a mouse, conjures a group of male mice to do… well, unpleasant things to her, and then has her other servant turn her into dinner. So, yeah, our leading lady is not a pleasant sort. If Metallia was the player’s character, it would be very difficult to connect to this game, I think. It’s not just that she’s an anti-hero; for far too long she’s a completely repulsive villain, and though we later find out that the truth of her is more complex than what we know about her for far too long, it’s hardly enough to validate her. She’s amusing in just how nasty she can be, but that’s about as far as she goes in terms of being likable. But, it’s worth noting that she’s not actually a bad character at all. In fact, the way the game really plays up to her sarcasm, cynicism and penchant for pure cruelty is a near-perfect play on all the fairy tale villain tropes that we all grow up with. Only now, rather than being present only when it’s convenient to throw an obstacle in the way of the heroes, in this particular tale she’s the focus of the story itself. It’s also interesting that the game goes to some lengths to explore the motivations behind Metallia. We’re not meant to connect with her, but we are meant to understand her, because it’s through her that we come to understand the character that we control in the game, The Hundred Knight. We’re in this adventure because The Hundred Knight is so adorable. A conjuration of Metallia’s will, The Hundred Knight inherits none of her personality. Rather, he’s a childlike innocence who is expected to indulge the beck and call of his master, and appreciate the scraps he gets thrown as ‘reward.’ His chief mission is to spread Metallia’s swamp across the world by destroying flower-like pillars located throughout it (because Metallia can only set foot in swampland thanks to a curse), but he’ll also be roped into spreading misery in other ways as he goes about his task. The Hundred Knight has something of a will of his own though, and at certain points it’ll be possible to question commands that he’s given. It is perhaps the most underdone part of this particular game. 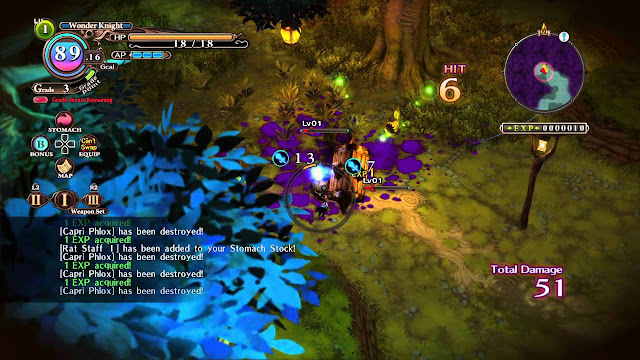 The set-up is all there for The Witch and the Hundred Knight to cleverly play within the fairy tale genre, by placing players within the perspective of the villain, and then allowing them to alter the particular course that you might expect these characters to take. Unfortunately a lot of that hinges on the tension between free choice and servitude that the Hundred Knight is meant to have, but with the narrative playing out much the same way, regardless of the response that players choose when making these decisions, this core theme is weakened somewhat. There’s still an interesting look on the fairy tale genre in there, but it could have been much more than it was. Related reading: For a more "western" take on the genre, there's always Diablo 3. Matt's full review. And it is worth emphasising again just how rapidly this game moves through its narrative. 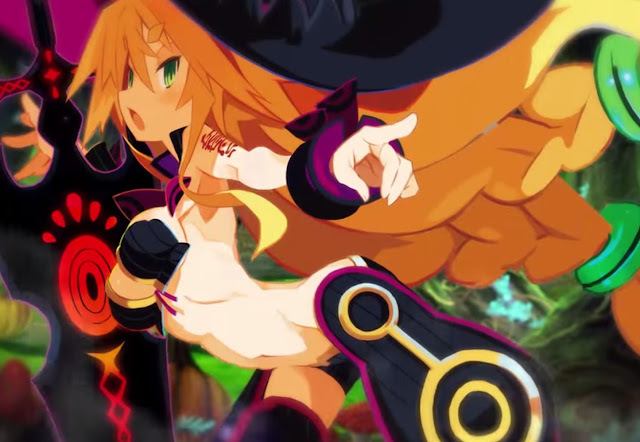 Aside from moments when you’ll spend time grinding for equipment or level, the plot of Witch and the Hundred Knight rips from one key scene to the next. It’s perhaps Nippon Ichi’s way of recreating the pace of real fairy tales – which were always quick reads over long, in-depth streams of philosophy – but in this game it’s a lot to take in at times. The later half of the game, especially, is especially pacey – you’ll need to pay attention to it all or it’s far too easy to fall behind. The game itself is a load of fun, and a perfect complement to the narrative itself. 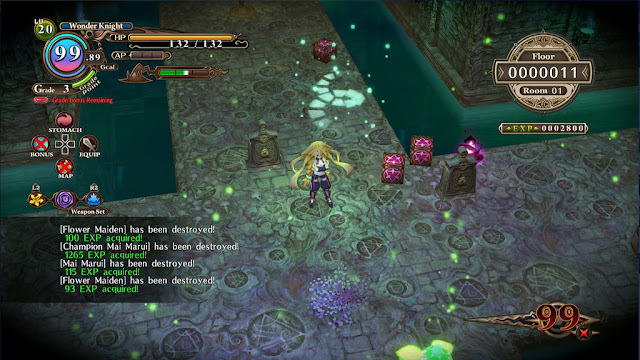 The Hundred Knight, in his quest for these swamp-spreading pillars, explores a series of levels that look like they’re pulled directly from the Grimm Brothers’ minds. Rich, brightly coloured environments are populated by enemies that are both cute and bright, while also being mildly disturbing in appearance. It’s a bright, magical, fantasy world, but it’s also a world that makes these things menacing and dangerous, and your core task, to spread the swamp around the world, leaves a sickly, unnatural green all over the place that immediately tells you that not all is well with what you are doing. The Hundred Knight is well capable of defending himself from the many menaces of the world, of course. The problem is that he’s a complicated fellow and you’re going to need to be patient in trying to figure out how all the systems go together. I’m not going to go in-depth here, because I don’t want to put you off with how dense it will all sound on paper, but yes, this game is a little overwhelming in the first couple of hours. In basic principle, The Witch and the Hundred Knight is a little like Diablo. You’ve got a top-down perspective of the action, and you’ll generally be taking on small hordes of enemies at a time in fairly fast-paced action combat. The Knight can take on a number of different “forms”, and these forms each provide him with different statistics and abilities – some are more defence orientated, others have a greater magic focus. This is much like Final Fantasy’s job system, and it means that anyone, regardless of play style, will find a way to tackle the game that suits them. The Knight will take stacks of weapons into battle – up to three sets of five weapons. 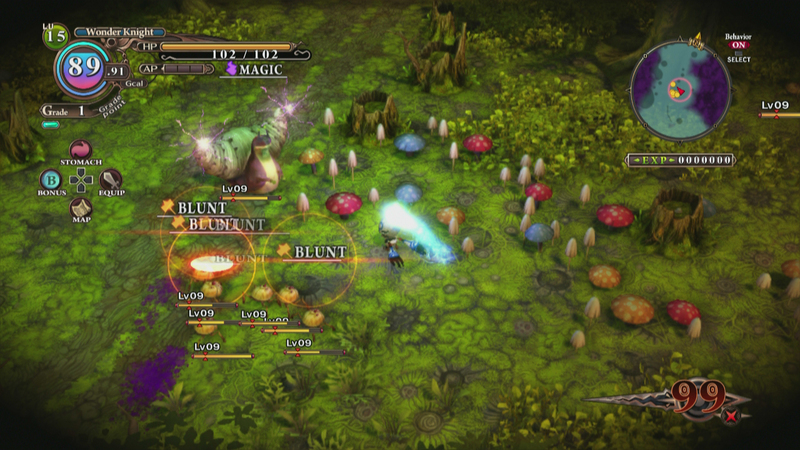 Enemies have different strengths and weaknesses, so being able to tackle one battle with a stack of five hammers, and the next with a series of spears and swords is important to making progress – when enemies are resistant to a kind of weapon they’ll take almost no damage from it, so building effective stacks of weapons is a key part of the game’s strategy. Then there is the time limit to consider. Every time the Knight enters a level, he has a number that starts ticking down from 100.0. Simply standing around doing nothing will slow the decline down, but as you start doing things, the number will start dropping fairly quickly. The goal is to get what you need done and get out of there before the number hits zero. This usually means you’ll duck into and out of a level a few times to explore around for treasure and grind up some experience before going on a run with the specific goal of tackling the boss at the end. Related reading: And for more NISA action, don't forget to check out Disgaea 5, also on PlayStation 4. There are also a wide range of magic abilities and one of the most complex inventory systems that’ll you’ll ever come across to manage, but the point here is that The Witch and the Hundred Knight has a lot of balls in the air, and juggling them all successfully takes some practice. It’s far less accessible than a game like Diablo, but once all those systems do click it all becomes a lot of fun, because while you might not have a lot of control over the Knight’s role in the narrative, you can take a great deal of ownership of his capabilities as a fighter. And as you might expect from the house that gave us Disgaea, the loot system is unbelievably complex. As a port of a PlayStation 3 game, the key features of this game include a clearer graphics engine, which actually helps a great deal. In the original release the graphics were fuzzy enough that it was difficult to keep track of what was going on – especially if the Knight was standing under a piece of terrain, such as a tree. It’s still not 100 per cent clear what’s going on at all times, but the improved graphics engine to mean that spotting little enemies or environmental features is easier. There’s also an unlimited tower to explore now. This is really just a series of challenge rooms filled with enemies that need to be cleared before moving on to the next one. It’s a handy way to grind away when the Knight is underlevelled and underequipped in the main story, but I didn’t feel like this particular feature added much to the overall experience. I have a real soft spot for The Witch and the Hundred Knight. I find that the complexity of its systems add a nice layer of strategy that most “Diablo clones” could benefit from. More than that, though, I find the narrative to be delightful in the way it revels in the Grimm Brothers’ sense of villainy, and then sticks you right in the middle of it and left to figure out for yourself if you’re comfortable helping a monster that completely evil.